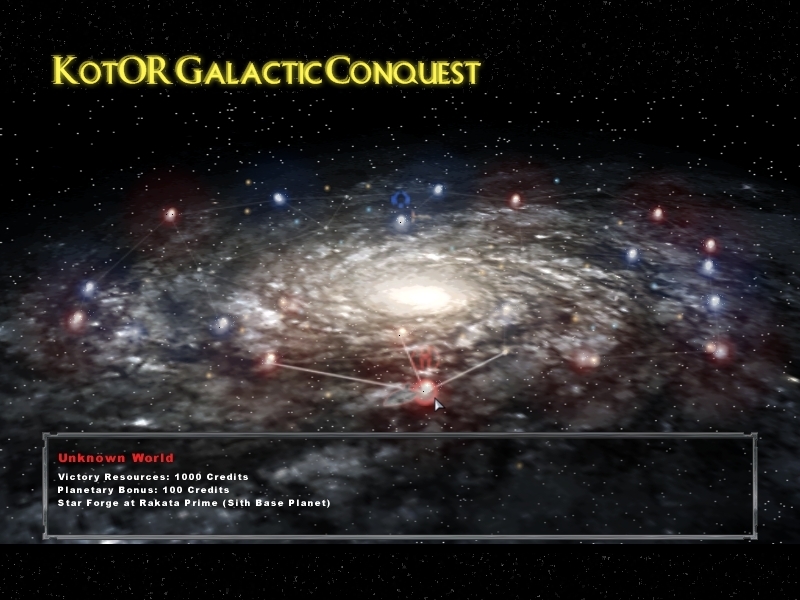 Add-on to Conversion Pack 2.0 that allows you to play the "Galactic Conquest" gamemode with the KotOR era. This is an addon built using the Conversion Pack 2.0's maps as a base. This will add an additional Galactic Conquest for the player - either "Jedi Civil War" (Old Republic GC) or "Advent of the Sith" (Sith Empire GC). If you have already installed the Conversion Pack 2.2 Patch, you do not need to worry about installing the abovementioned (v1.3) patch. Men does this galactic conquest replaces the original? or just adds another one? the units too? Adds a new Galactic Conquest with KotOR units. It doesn't work. I followed the install completely. Make sure to read through the "help!" document that comes with the mod (it's in the same folder as the readme). It covers some of the potential installation pitfalls. Of course you need to own the game. judging by that he said nothing is overwritten, i'm thinking that this still keeps regular gc. ive tried to unpack the kotor gc at the right places, i have the conversion pack ,but it just wont work, so what do i do? and can someone give me a link to the r117 1.3 patch? The r117 Unofficial 1.3 patch is included with the Conversion Pack's 2.2 Patch. Download and install that and everything should work fine. No, it will not say that. The 1.3 Patch is an unofficial game patch. You probably have too many mods/maps installed at the moment - I suggest you remove some mods or maps from your addon folder (the game does have a hard limit) and restart-up Battlefront. do i really need to? cause the only thing i have is the unofficial patch 1.3, conversion pack 2.0, and the conversion pack 2.2 for mods, the maps i have are the one that this mod put in, other than that there's nothing extra. i think that i'm just missing the map for the space battle with kotor, cause the clone wars and galactic civil space battles work fine in galactic conquest and every other map too, i think i must've accidently deleted the map when moving files around trying to get the galactic conquest to work. There is a chance - if you want to fix that, the addon folder for the KotOR space map is (like you see in the error above) "SK1". If you redownload and reinstall (the whole thing or just the map; it's a small download) you should be A-OK.
wy i can play as sith in galactic conquest!?!?! I've installed the mod and Jedi Civil War appears under galactic conquest, but when I click on it to play nothing happens, not even a sound to acknowledge I clicked on it. I unarchive it to desktop then move too my BF2 Folder when i select JEDI CIVIL WAR in the GC screen nothing happens. When i select another all the symbols are mixed up. hey this mod supposed to let you play as jedis and the siths but there is no option for the siths, I did something wrong in the installation or what? Starwarsbattlefront.gamefront.com in this place they say how to play with the siths: There are two different custom "Galactic Conquests" you can play. the Sith," is its counterpart, the "Sith Empire" Galactic Conquest. all it takes to play the other. The text document "SwitchingFactions"
tells you how to do this. If you want to play one or the other, make sure its file is in the "GameData\DATA\_LVL_PC" folder (the folder outside this folder). You CANNOT have two separate custom Galactic Conquests running at the same time, so when you want to switch, move the one you're NOT playing to this folder, and the one you want to play to the "_LVL_PC" folder. By default, "custom_gc_5," the Old Republic GC, will be enabled. is it normal for the game to tell you that you have to many missions? for some reason when I did a space battle and the game crashes and gives me an error box saying "Fatal Error"
here is the error that it gives me "Could not open MISSION\SK1k_ass.lvl" how do you fix this? Did you put in the KOTOR>GameData into the Star Wars Battlefront file?